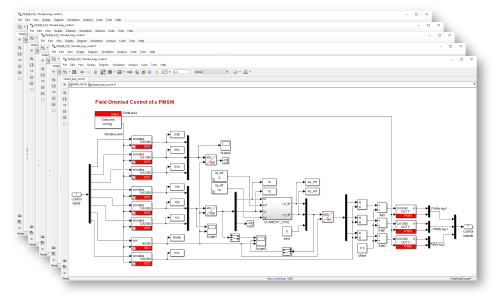 Thanks to the support of the code generation from Simulink™, users are provided with a complete solution, from computer simulation to real-time control tuning on real hardware. 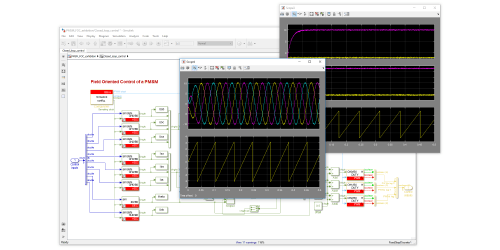 In addition to the C/C++ coding approach, the development and testing of converter control can also be done directly from Matlab Simulink™. With the BoomBox blockset for Simulink™, users can benefit from a fully automated generation of code, but also control pre-validation thanks to an accurate system modeling during simulation. Two workflows, only separated by one click ! 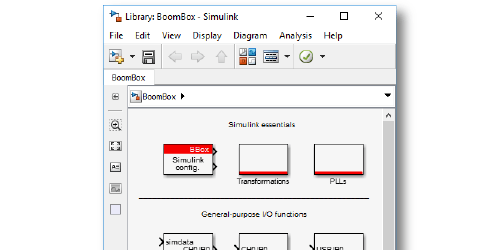 The BoomBox Blockset for Simulink provides a dedicated block for each hardware peripheral. It then appropriately calls the pre-optimized C/C++ routines during runtime, or executes the corresponding subsystem model during simulation. This way, pre-validating your control with computer simulations before executing it for real is absolutely straightforward. Besides, you can always work iteratively and come back to simulation afterwards ! 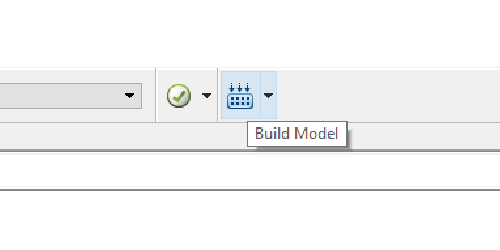 The Simulink Blockset for BoomBox is engineered to be easy to use. The configuration windows are kept simple and self-explanatory so that users don’t get lost. 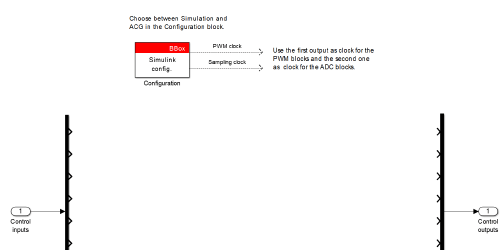 Interactions between blocks are the same as with any other simulink library functions. Therefore, absolutely no experience is needed to start working with the BoomBox. 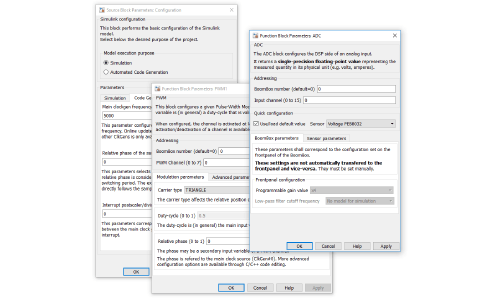 With imperix’s Simulink templates, the whole environment is specifically configured so that the simulation is truly representative of what occurs in real world. 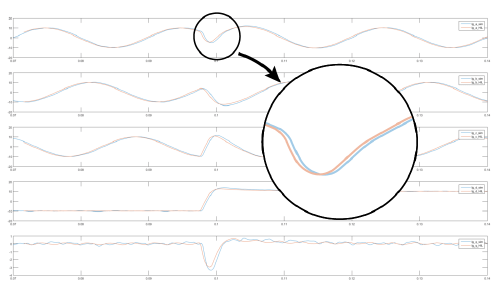 For instance, sampling instants and PWM phase shifts are modeled accurately. This insures the smoothest transition possible from simulation to real power. Thanks to Simulink’s powerful code generation engine, you can generate code for almost anything that can be simulated. This allows users to reuse almost any control code from existing projects and simply update them for real time execution in no time. With the Simulink environment on BoomBox, you’re not left alone! You can always get inspiration or start from one of the available code examples to save time and efforts. You only need few steps to implement your control, test it in simulation, run it on the BoomBox and test it experimentally. What’s more, you don’t even need any coding skills ! Starting with our template or one of our examples, you will have everything configured for you and ready to start working right away. Implement your control thanks to the provided blockset. Our library contains everything you need to interact with the BoomBox, and more! 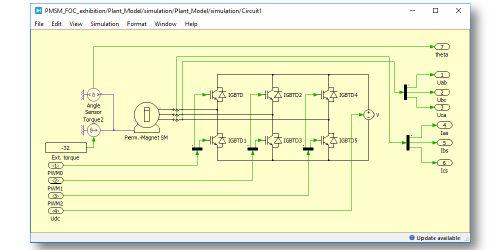 Draw the electric scheme of your converter inside PLECS or Simscape Power Systems. They both provide an easy way of simulating hardware on which to challenge your control. Launch the simulation and study the behavior of your control. 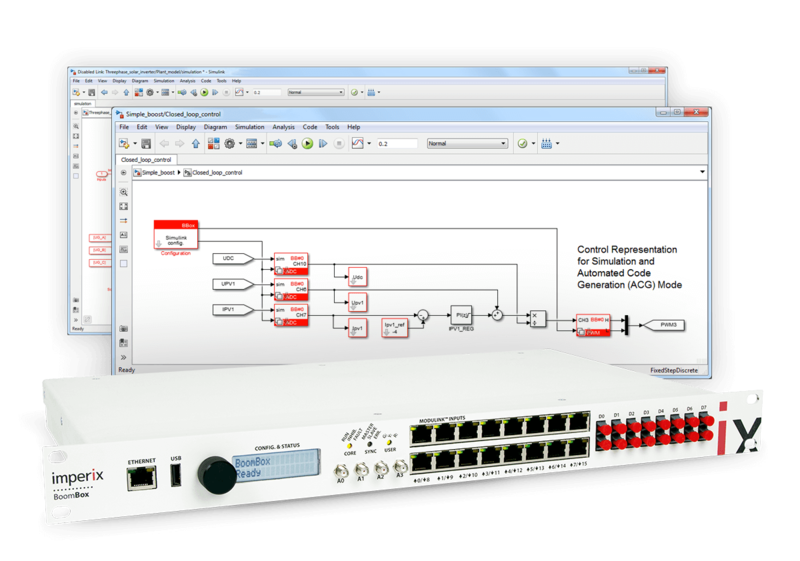 Thanks to realistic simulation parameters, you will be able to fine-tune your control off-line effectively, before giving it a try on real hardware. When it’s time to switch to real world, uploading your code into the BoomBox controller is as easy as clicking the ‘Build’ button. Programming a real-time controller has never been so easy! 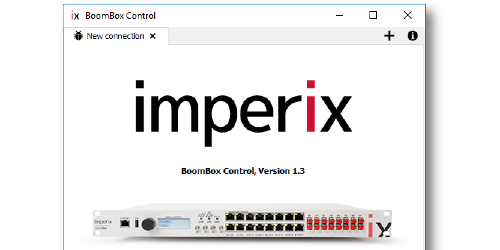 Once your code is running on a BoomBox, monitor and alter your variables with BoomBox Control. Changing your setpoints, sending commands and saving plots will give you easy access to high-grade experimental results.